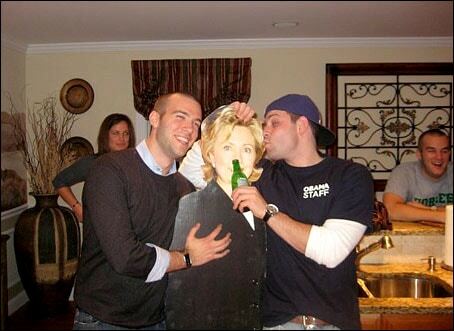 Nobody is kidding here…This is really the head speechwriter…..
Incoming Obama administration director of speechwriting Jon Favreau (L) (he’s 27 years old) and a friend pose with a cardboard cutout of incoming Secretary of State Hillary Rodham Clinton at a party. Favreau’s case seems unlikely to be so dire; Clinton senior adviser Philippe Reines cast the photos as evidence of increased bonhomie between the formerly rival camps. “Senator Clinton is pleased to learn of Jon’s obvious interest in the State Department, and is currently reviewing his application,” he said in an e-mail. You are currently browsing the archives for the head speechwriter category.